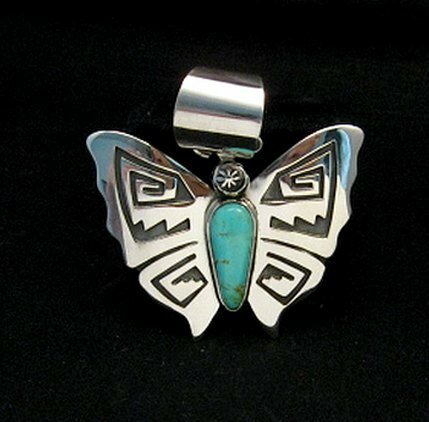 This large Navajo hand made turquoise and sterling silver Butterfly pendant is another original design by Navajo artists, Everett & Mary Teller. 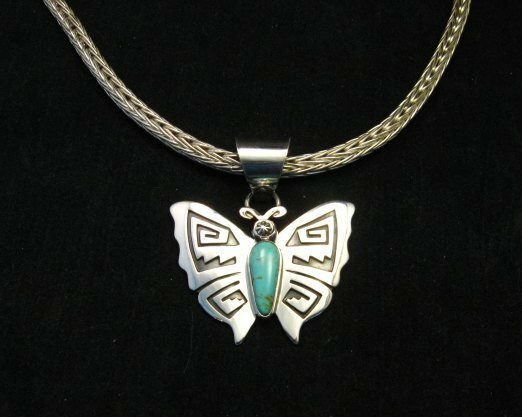 This beautiful pendant features a silver overlay butterfly with a natural Kingman turquoise body. The stone is in perfect shape with a few matrix lines (which are not cracks in the stones). The butterfly measures 2 inches wide from wing tip to wing tip and 1-5/8 inches tall, not counting the over-sized bale. The bale can accommodate a necklace up to 5/8 inch in diameter. It is shown here with one of Travis Teller's signature woven sterling silver chains, which are available in different lengths, sold separately. Brand new and in perfect condition. Gift Box and Authenticity Certificate included. Hallmarked by and purchased directly from the artists. All of their pieces are signed with their initials EMT encased with a fish symbolizing their Christian faith. 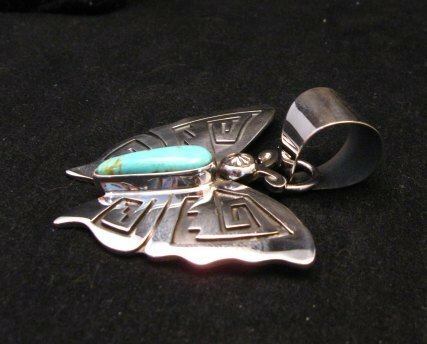 About Everett & Mary Teller: These self-taught silversmiths have been making jewelry for over 25 years. They incorporate the storm pattern designs on all their jewelry pieces. They carefully design their pieces and select the stones using a wide variety of natural stones. 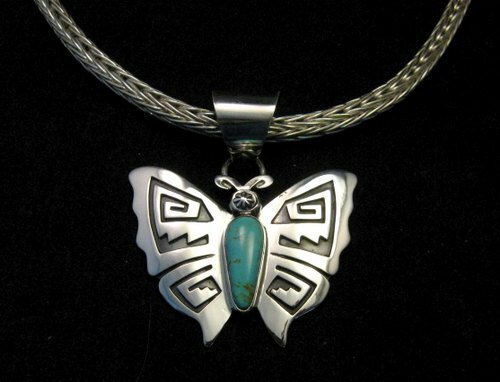 They show their work in galleries as well as prestigious art shows such as The Heard Museum and Santa Fe Indian Markets. The workmanship is impeccable - you can always depend upon quality when you purchase a piece of Everett & Mary Teller jewelry. Silver Overlay is a process of soldering one piece of silver, from which a design has been cut, over another piece of silver. The top layer is a handmade, hand cut overlay created from a sheet of sterling that is then bonded to the base layer of sterling. The base layer background is usually oxidized oxidized, which turns the silver surface black. The oxidation brings out a contrast between the two pieces and makes the individual designs more visible.